No? Rebecca is in fact about a shy woman who marries a man who lives in a big old house and then is weirdly traumatized by the housekeeper who idolized the man’s first wife? Oh. Well, forgive my confusion, because I just saw those red licks of flame on the big ‘R’ there and assumed that the only reason those would possibly be on a Broadway show poster was if it were going to be a musical about dragons, or possibly Corky St. Clair’s long-awaited transfer of ‘Backdraft: The Musical’ (with real flames!). 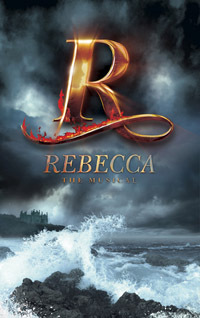 Now, in itself, a musical version of the classic movie ‘Rebecca’ isn’t a bad idea. There’s high drama, love and death and obsession and big houses in the British countryside. However, I don’t remember it being about the dangers of living on the British coast. But oddly enough, the main image (if we put aside that giant R for a moment) is of the tossing waves of a stormy sea (which are close enough to those red flames that one wonders if they couldn’t just handily put out that dragon fire), with a dark and foreboding house (presumably the famous Manderley) lurking in the background. Now as I recall, the ocean does play a small part in the unfolding of ‘Rebecca’s plot, but only a small one – perhaps this is all intended to be somehow metaphorical? The waves are the waves of high drama, crashing onto the rocks of emotional wrenching-ness? No? Let’s move upwards a bit, past the turgid grey clouds of inevitable power ballads, and back to our friend the big flaming R. Clearly, this is the fancy part of the house, representing the majesty of Manderley. But it’s a bit too shiny, isn’t it? It looks like the logo of a tacky hotel chain that advertises itself as being classy but where all the flower arrangements are fake and slightly dusty. And combined with the background, there’s sort of an interesting wild/civilized juxtopposition that almost works, but mostly just makes the whole thing look like an ad for the new hotel, the Wuthering Hilton. And oh look, if the shinyness of the gold and the odd red flames (can gold burn, anyway?) didn’t seem like enough to burden this one letter with, they’ve also helfpully stuck a face inside the R (side note: between this and ‘Bring it On’, what is it with shoving people inside show logos? Is this a strange new trend?). And by ‘inside’, I don’t mean in the little picture window helpfully provided by the shape of the letter ‘R’ itself, I mean awkwardly stuck in the long side part. Because in case you’ve been looking at the poster and confused because, wait, is Rebecca the one with the crazy attic wife, or the one with Heathcliff? And did Daniel Radcliffe just star in a movie version of this?, the lady in the shiny R is here to remind you that, in fact, ‘Rebecca’ is about a woman. Three women, actually: Cathy, Jane Eyre, and Leona Helmsley. Just kidding! It’s the unnamed protagonist, crazy housekeeper Mrs. Danvers, and the titular Rebecca herself, perhaps the most complicated, magnetic, fascinating character ever to dominate a story in which she never technically appears. And lest we forget, the story that ‘Rebecca’ tells, about this strange triangle between these three, is a great story, one of the best psychological thrillers out there, and deservedly a classic. But according to this poster, the show about storms and fire and trapped faces and shiny gold splendor. But hey, maybe the show won’t be so bad. Fingers crossed they did add a dragon. ← Wow, that recent revival of ‘South Pacific’ was a lot stranger than I remembered. I disagree, the rocky coast is a dominating feature in the story, but, it is true that you don’t completely get the sense of it in the movie, which is actually based on a novel by Daphne DuMaurier, where the coast and the ocean are a huge presence. There is also a huge fire, so that makes sense to me too. You’re right on the money. Please go see the show and share your impressions with us! But be aware that the show might actually be even worse than the artwork.